Speed, gravity, acceleration. If you’ve ever been a passenger in a vehicle that takes the curve with gusto, you’ve had a taste of G-force. It requires you to both hold on tight and let go. There is a push/pull effect, leaving you both taken aback and wanting more. 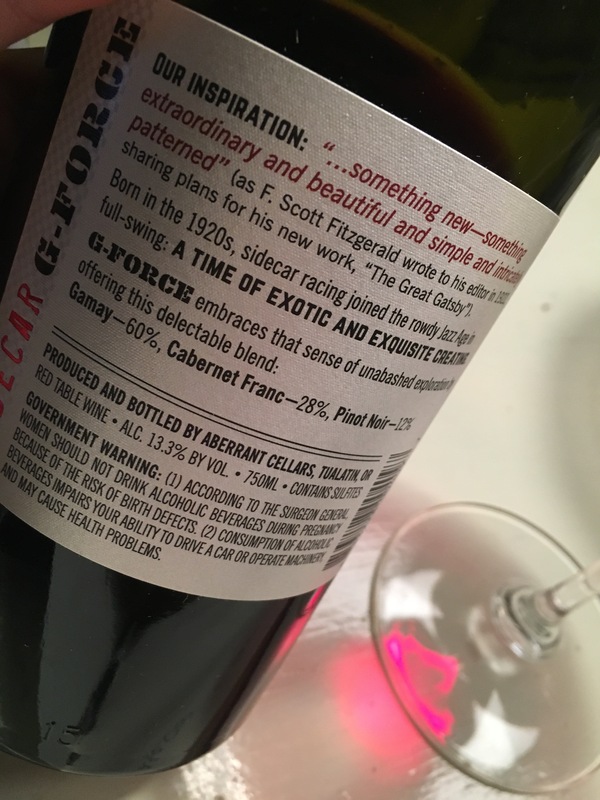 Was that the sensation Eric Eide was going for with his 2015 Sidecar-G-Force wine? Well, if so, it worked. It is the wine I can’t stop thinking about. The Gamay and Pinot each spent 12 months in barrel, the Gamay was in neutral oak, the Pinot 20% new. the Cab Franc spent 15 months in barrel, 25% new. Each racked in tank for 3-6 months. They were blended a month before bottling. This wine quickly accelerates with bursting red fruit-cranberry, raspberry, cherry. It hugs the curves with a gorgeous mouthfeel- elegant tannins, balanced acidity. It finishes like a champ-hints of white pepper, violets, rose petals. The wine is at once vibrant and restrained, hitting the push and pull. There are so many good wines out there that it is rare for me to seek out a repeat that I have to special order. I usually note the wine, maybe make plans to visit when in the region, share with others. But Aberrant Cellars has done it again, producing a wine I can’t stop thinking about. This is a ride I can’t shake, a thrill I want to revisit. I have heard of these wines. I am so intrigued. Sounds delicious!